Routers are ideally suited for dimensional sign making, woodworking and parts fabrication. Designs can be cut using a variery of materials - foams, plastics, woods and non-ferrous metals. Router systems offer high precision and exactness of repeat orders. 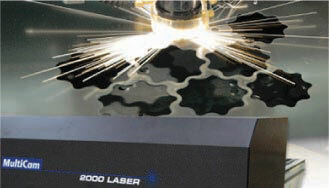 Cutting with a 0.005" beam of light is one of the latest technologies we have brought to our facility. Able to raster engrave and vector cut in one process, the CNC Laser is perfect for cutting a wide variety of materials including plastics, wood and light-gauge ferrous metals. When machining acrylic, the laser cuts and polishes the edge in the same pass saving valuable production time. We use the highest quality metal forming technologies for fast project turn around times and consistent repeat orders. 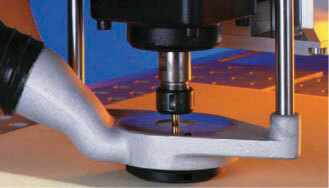 Accu-Bend is the first machine in the world to notch, flange and bend complete channel letters. Our TurboBend Plus metal folding machine allows for extreme accuracy when making the most complex of shapes. Both of these systems give us the ability to consistently deliver top quality products. 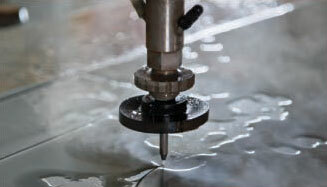 Our newly installed Flow Water-Jet system offers unique advantages over other cutting technologies. 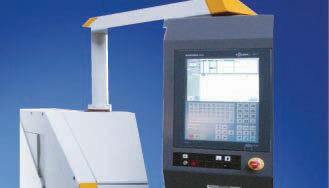 It is capable of cutting virtually any material with a high degree of accuracy and without heat.